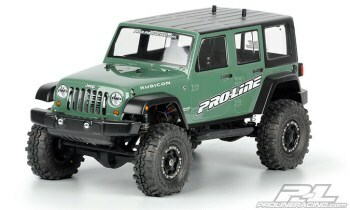 are now available from Pro-Line for 1:10 Scale Builders and Rock Crawler owners. made it an automotive classic. ready for off-roading in a dirt field or rock mountain near you. Group LLC 2010. ?? Chrysler Group LLC 2010 . Extended rear body post are required - NOT INCLUDED. When mounting on an Axial SCX10... #AX80031 body post is required. *This comes in clear no paint!